A dinosaur smackdown is set to be featured on display in the upcoming dinosaur and fossil hall at the Smithsonian's National Museum of Natural History on the National Mall. Check out the photos to get a sneak peak. 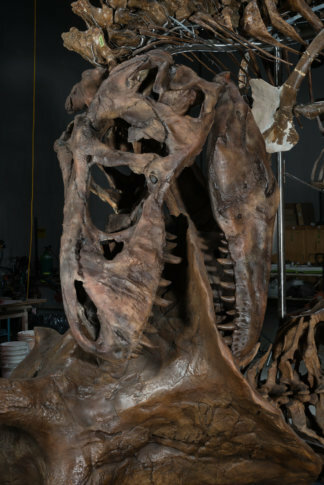 WASHINGTON — Get ready for the Tyrannosaurus rex vs. Triceratops smackdown that is set to be a featured display in the upcoming dinosaur and fossil hall at the Smithsonian’s National Museum of Natural History on the National Mall. What the Smithsonian has dubbed “the nation’s T. rex” was delivered to D.C. in 2014, a few years after Johnson was named director and learned that the museum didn’t have an actual fossil of a T. rex, only a replica of one. “What? We don’t have a Tyrannosaurs rex? That is absurd!” Johnson remembers saying. So, he arranged to get one on loan from the Army Corps of Engineers that manages a property in eastern Montana that is rich in dinosaurs. “The point of a museum is that we are the place in our culture where we keep and preserve the real stuff of planet Earth — the amazing stuff,” Johnson said. Called the Hall of Extinct Monsters when it opened in 1911, the new dinosaur and fossil hall exhibition is slated to open in June 2019 and will tell the tale of the entire history of life on Earth. Renovations, now complete, included support being added under the structure of the building to help hold up the massive dinosaurs to be put on display. To make room for renovations, the old fossil hall had to be deconstructed. See time lapse footage of that break down here. Modern 3-D scans and digital posing technology have allowed skeletal mounts to be built to display the animals in ways showing the grace and movement of living animals as opposed to standing there like big bricks, Johnson said. A self-proclaimed “museum guy” since he was 5 years old, Johnson started collecting fossils when he was a kid. 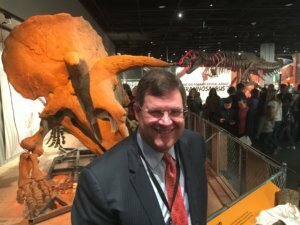 Now he is working at a frequently-visited natural history museum in D.C. and awaiting next year’s opening of the new permanent dinosaur and fossil hall.